It was a display of monochrome at last nights EE BAFTA awards held at London’s Royal Albert Hall. With most falling into either full black or white, some were braver and chose to honour the traditional combination of shades, Olivia Coleman gave a stately turn in Emilia Wickstead whilst Thandie Newton went for full froth in Valentino. Ethereal silhouettes were seen on the Duchess of Cambridge who wore trusty Alexander McQueen and Rachel Weisz in Gucci. Newcomers Rami Malek and Letitia White kept things fresh wearing white tailoring alongside ceremony host Joanna Lumley and Mary J Blige who brought a bit of Hollywood in a Ralph & Russo embellished variation. See the slideshow below for our favourite looks. Duchess of Cambridge in Alexander McQueen, 2. Rachel Weisz in Gucci, 3. Letitia Wright in Stella McCartney, 4. Mary J Blige in Ralph & Russo, 5. Rami Malek in custom Louis Vuitton, 6. Glenn Close in Alexander McQueen, 7. Selma Hayek in Gucci, 8. Kate Blanchett in Christopher Kane, 9. 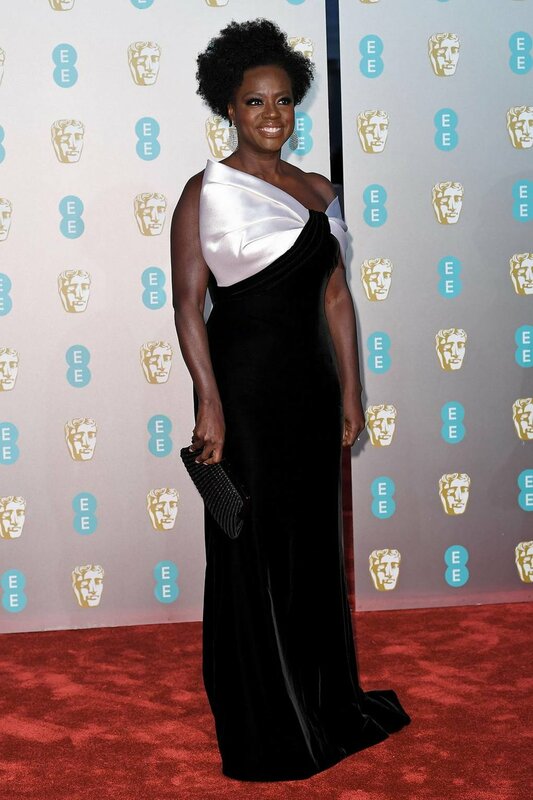 Viola Davis in Armani Privé, 10. Olivia Colman in Emilia Wickstead, 11. Thandie Newton in Valentino. Starry Starry Night!! The Golden Globes never fail to kick off awards season with more than a sprinkling of stardust! As a prelude to The Oscars its the first event of the year we get to see our favourite A-listers grace the red carpet in custom made and couture and last nights ceremony certainly didn’t disappoint in the style stakes. With Lady Gaga’s Cinderella-esque Valentino gown and Lupita Nyong’o’ s by appointment Calvin Klein creation, it was a night of high glamour and more is more! Heres our pick of our favourite looks! 1. Lady Gaga in Valentino 2. Isla Fisher in Monique Lhuiller 3. Julia Roberts in Stella McCartney 4. Regina King in Alberta Ferretti 5. Claire Foy in Miu Miu 6. Jodie Comer in Ralph & Russo 7. Lupita Nyong’o’ in Calvin Klein 8. Emmy Rossum in Monique Lhuiller 9. Sandra Oh in Versace 10. Kristen Bell in Zuhair Murhad. “Launched in Spring 2014, Ellie Lines is a British luxury dress label which focuses on 100% silk in Ellie’s exclusive prints and is manufactured in London where she is based. Working for many years as a fashion stylist with various international publications, designers and people within the film and music industry, Ellie Lines nurtured her love of beautiful pieces and used this as the inspiration behind her collections. Inspired by the jet-set era of the 60’s and 70’s encapsulated by the photography of Slim Aarons in his book Poolside, Ellie has created dresses that are luxurious, stylish and above all fun, each piece designed with a friend in mind, capturing their spirit and personality to create stunning dresses that real people will enjoy. Gracing an array of glossy magazine covers and charted by Grazia as ‘Label To Watch’, the brand has a loyal following from the likes of Style Queens Claudia Schiffer, Fearne Cotton, Emilia Fox, Melissa Hemsley, Sarah-Jane Mee and Holly Willoughby to name a few. The latest collection see’s the introduction of separates to the brand. Continuing to design with friends in mind, they are true classics that you can always rely upon to take you from the office to the party. Pulling together her knowledge of how a really great pieces work with themes from the past, Ellie has created a timeless collection that will always be your friend.